FolderJump is a simple and handy add-on for Windows Explorer. It is compact and installs in few seconds. It helps you switching in 2 clicks between the folders of your choice. 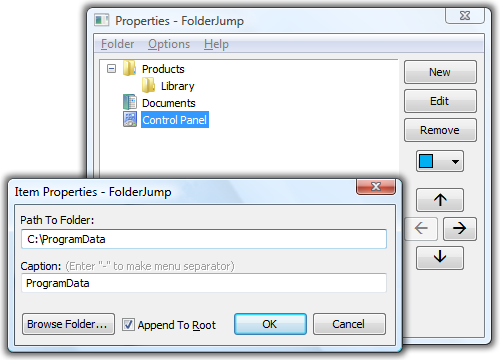 FolderJump appears in context menus of Windows Explorer and standard «Open File» or «Save File» dialog boxes as «FolderJump» item with a submenu. Bookmark your favorite folders! Organize the favorite folders into hierarchical submenus! Click a bookmarked folder, and FolderJump will instantly bring it to you right into the same window of Windows Explorer or Open/Save dialog box! Figure 1. FolderJump is ready to instantly switch to a different folder. With FolderJump, you can do many repetitive tasks much faster. Switch in 2 clicks between bookmarked folders in Windows Explorer and many other programs. Copy in 2 clicks selected file or folder to a bookmarked folder (Ctrl+clicking a bookmarked folder). Move in 2 clicks selected file or folder to a bookmarked folder (Ctrl+Shift+clicking a bookmarked folder). FolderJump can help you even more by giving you 3 small but very useful additional context menu commands, and they are FREE. Every such a command can be turned on and off according to your needs. When enabled, the command appears in the menu next to the «FolderJump» command. Opens the selected file in Notepad or a custom editor. No more need to make temporary or permanent file associations! Note: Holding down Ctrl+Open in Editor launches the editor in Administrator mode. This can be useful when modifying files in the system protected folders such as %ProgramFiles% or %Windows%. Launches CMD.EXE using the selected folder as working directory. Note: Holding down Ctrl+Command prompt from folder launches CMD.EXE in Administrator mode. Copies the full paths of the selected file system objects (files, folders, special objects) to Clipboard. We use Share*It! (a Digital River company), one of the world's big software transaction managers. It provides online secure payment processing. We will have no access to your credit card or banking information. It's instant for the payments made by credit or debit cards, or PayPal: you will receive a Download Link immediately right after you have made your order. Share*it! will show you all the necessary information online on their website, and will also send you this information by the email. You use «Properties» dialog to manage your favorite folders list: add new, edit, change order and nesting level, and remove elements. You activate this dialog by clicking «Properties…» menu item in the FolderJump's context menu. Using the arrow buttons, the items in the tree can be moved up and down, and also indented/unindented making nested submenus. Figure 2. FolderJump «Properties» dialog with active «Create New Item» dialog. «Folder» menu contains the commands for managing the favorite folders structure. It duplicates the button commands yet works as a «memory card» showing the keyboard shortcuts available for the commands. «New» adds a new item. «Edit» modifies a selected item. «Remove» removes a selected item. Note it also also deletes all subitems, if any, of the selected items. 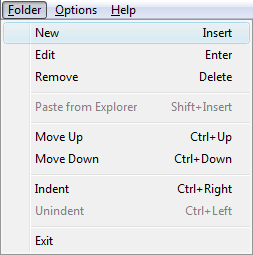 «Paste from Explorer» adds a folder copied into system clipboard from Windows Explorer. The new element is added as a child of a selected item. Note this command is diabled when there is no suitable data in clipboard. «Move Up» moves a selected item up in the list. «Move Down» moves a selected item down in the list. «Indent» increases nesting level of an item (makes it a child of previous sibling item). «Unindent» decreases nesting level of an item (puts it at the same level as its parent item). FolderJump consists of two dynamic-link libraries (DLL), one is 32-bit and the other is 64-bit. Their functionality is identical. The first is designed to work with 32-bit Windows applications and the second with the 64-bit ones. You can export and import the FolderJump settings using the standard RegEdit utility. In Windows Explorer, double-click the *.reg file you created. This will import the FJ settings back into Registry.